I am a fan of using airtight containers in my kitchen. It took me a while to come around, but now that I know the benefits, I am a believer. I also think I might be able to change your mind if you are against or sway you if you are on the fence. Here are the Pros & Cons:. A pantry or cabinet filled with nice uniform and clearly labeled containers looks beautiful. Storing items in their original packaging, even if they’re well organized, certainly will never look as good. * I realize this reason on its own may not convince you. If you use clear containers, it takes only a glance to see when you need to restock the contents. * OK, This is useful. By keeping items in containers sized to fit your storage areas, you are often able to make better use of your space. * This is a big one for me. Transferring foods into airtight containers can help them last longer and will defend them from insects or other pests. * This is what sold me. I just went thru a Grain Beetle and Moth infestation and saw how my unopened packaged food was still susceptible to insects and all of my contained pastas, grains and baking items were untouched. I immediately became an advocate and urge you to consider especially with Summer quickly approaching (or is it here?). Ok, here are the Cons. It takes extra time and effort to fill and refill containers. You also need to decide what to do when items run low. Do you wait till you use every last bit? Or do you pour fresh supplies over the old ones? Or transfer the old stuff to a bowl, pour in the new, then dump the old on top? You’ll need to wash your containers periodically too. * Yes, it takes time. If you buy in bulk, or even if you have regular-sized packages that you’re waiting to transfer to containers, you’ll need extra space to store the original packages. * For smaller kitchens or homes, this can be an issue. 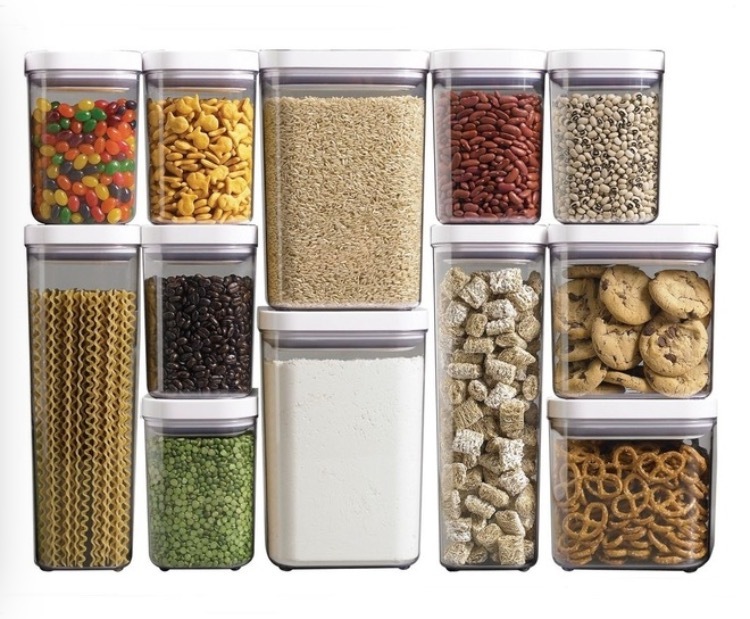 Although you may save money by buying bulk goods, you may need to spend money on new containers. You might be able to reuse some old containers, but it’s likely you’ll need to purchase at least some—and possibly a lot—especially if a coordinated look is important to you. * Again, a little more work. 5. It Can Be Challenging If You Don’t Buy The Same Types Of Food. It can get complicated if you vary the types of items you buy from week to week. You’ll either need a lot of containers and room or you will need a secondary system. * Since the bug fiasco, I put one-time purchases in the freezer. This is the best way to kill any bug eggs (that unfortunately usually exist). So, When do I Use Containers? I tend to put all of my open products in containers. I have one for Flour, sugar, etc. I also use containers for any open packages. If I don’t use the entire box of pasta, any opened cereal, large bags of rice, etc. As with all things organizing, you need to do what works for you. If pretty containers make you happy, fill your cabinets with them. If it seems like too much of a bother, then scratch the containers. I would love to hear your thoughts and opinions.